Through Karyapaddhati the awareness of the need of organized work for the regeneration of nation is generated. This energy is channelized to undertake a number of activities to actualize Swami Vivekananda's vision of Jagadguru Bharat. Kendra Karyakartas are spreading Swamiji's message of selfless service and love for the country and pride in our culture through these karyapaddatis. Kendra organizes every year three stage karyakata prashikshan shibirs to induct new workers to its cadre.Besides numbers of camps like Yoga Shibir, Spiritual Retreat, Maitri Shibir,Personality Development Shibir are also organised at different places. Vivekananda Kendra works to create the awareness for the need of organized work for regeneration of nation.Such awareness is reflected in ever-growing activities. Some of these activities are undertaken by projects especially created to cater to the needs efficiently.Vivekananda kendra Natural Resources Development Program, Vivekananda Kendra Vedic Vision Foundation, Vivekananda Kendra ArunJyoti, Vivekananda Kendra Institute of Culture, Vivekananda Kendra Medical and Research Foundation, Vivekananda International Foundation, Vivekananda Kendra Vidyalaya Arunachal Pradesh Trust, Vivekananda Kendra Shiksha Prasar Vibhag, Vivekananda Kendra Utkal Seva Prakalp, Vivekananda Kendra Seva Va Prashikshan Prakalp and Vivekananda Kendra Prakashan. Over 64 Vidyalayas for tribal and rural children in Arunachal Pradesh, Nagaland, Assam, Andmans, Tamilnadu and Karnatak. 150 Balwadies all over the country. Running of Non-formal school for preservation of Vedic Vidyas. Personality Development Camps for the children. Youth Camps to motivate them to lead purposeful life. Cultural Examinations to increase the awareness in students about the greatness as well as relevance of Indian culture. Matru Sammelan and Women Awareness Camps for tribal women to motivate them to lead purposeful life. Deep Pooja and Shiva pooja. Vocational Training in Assam, Arunachal Pradesh,Karnataka and Tamilnadu. Amrita Surabhi Daily offering of handful rice by women, which is collected to feed around 12,000 poor rural children. 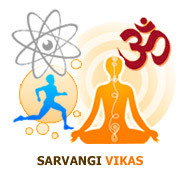 Residential Yoga Shibirs of 15 days duration. Residential Spiritual Retreats of 7 days duration. Promotion of use of natural resources like biogas, building materials, herbal medicines. Training masons, farmers etc.in appropriate rural technology. Seminar and lecture series in Vedic Studies and publishing of Vedic literature. Seminar, workshops and symposiums to create awareness in ecology. Seminars and symposiums on traditions of VAnavasi communities for their protection and promotion. Hearth care camps including eye check up and operation. Inter-civilization dialogue and understanding in perspective of Hindu civilization. Research and documentation of traditional Customs, Tituals of Vanvasi communities. Publishing thought provoking literature through magazines like Yuva Bharati (English Monthly) ,Vivekananda Kendra Patrika (English, Thematic Six monthly), Kendra Bharati (Hindi monthly), Vivek Vichar (Marathi, monthly), Vivek Vani(Tamil monthly), Jagriti(Assamiese & English , three monthly), Vivek Sudha(Gujarati, Three monthly) and many other books also. The vision of Swami Vivekananda was to rebuild Mother Bharat in tune with her personality enshrined in yoga and spiritual lore. The genius of Eknathji Ranade located the holistic concept of yoga, another name for spirituality in the words of Swami Vivekananda 'Each Soul is potentially Divine,' and adopted it as the basis of Vivekananda Kendra(VK). He could see the vision of Sri Aurobindo enunciating Integral yoga as a furthering depth of Swamiji's thoughts on yoga. Eknathji trained in the organizational skills and powered by a patriotic favor with the holistic vision of Hindu nation enunciated a century ago by Swami Vivekananda, in tune with the emerging trends of popularity of yoga gave a direction to the Kendra in his first pamphlet 'Yoga, the core of Vivekananda Kendra'. To integrate the individual with society. To channelise the energy of organised collective life for productive Nation building work. Transforming our people's inherent God-wardness into the right spiritual urge rising out of the teachings of the Upanishads, namely. "Each soul is potentially divine"
"Faith in God, in turn means faith in one's self i.e. in one's potentiality to rise to divine heights. To convert the spiritual fervour thus released into work of National reconstruction. Comming,thinking and working together for National Resurgence. Clarity of thoughts in National perspective. To know about our achievements and potentialities as a nation. When will our thirst for freedom be quenched? Only when our obsession for slavery is killed. Children are not vessels to be filled; They are lamps to be lit!